I Have the Need for Speed! Need for Speed Nitro is the first game in the series that is fully customised for the Wii. 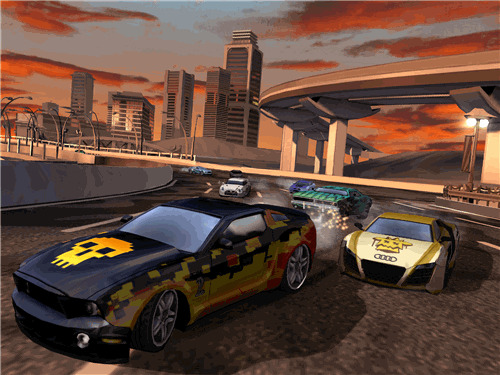 Previous Wii versions of this racing video game series, like NfS Undercover, have been ported onto the Wii with mixed success. Nitro is an arcade-style street racing game with a huge selection of real-world cars. You'll be able to choose from a range of classic and muscle cars, and then fully customise your wheels with paint jobs, graffiti, stickers and engine tune-ups. In a first for racing games on the Wii, NfS Nitro will offer loads of different controller scheme options. You'll be able to race your shiny new machine using the Wii controller on its side (or in a Wii racing wheel attachment) and control your car by turning it left and right, like in Mario Kart. You'll also have the option of pointing the Wii remote at the screen and controlling your car by twisting your wrist to the left or right. In addition to the Wii remote, you'll also be able to race with the nunchuck, the classic controller or the Gamecube controller. Nitro will have a few different types of racing events including regular circuits, time trials and elimination races, where the car in last place at the end of each lap is eliminated from the race. These events won't be new to car racing video game fans, but they do offer variety, and most gamers are sure to find a race event they really like. The main gameplay mode is World Tour, which is essentially Nitro's career mode. Career modes have become a staple part of sports and racing video games, starting off with a basic heap of metal and earning upgrades, skills and modifications as you play through the game. The Need for Speed Nitro Career mode offers six different racing locations. Starting in Rio de Janeiro in Brazil, the racing circuit moves through Cairo, Singapore, Madrid and Dubai. Every race track is divided into five different zones with a different racing objective in each zone. Completing objectives and races earns you new upgrade items, making your car faster and cooler. Higher placed finishes earn you extra upgrades that let you dominate the competition and leave your personal graffiti art work plastered over the race course. In NfS Nitro, interference from the police plays a big role in the game through the new Heat meter. The higher your Heat meter, the more attention you'll get from the cops. The way to lose the cops is to pick up shield boosts scattered around the track. Picking up a shield boost lowers your Heat meter, sending the cops after a nearby driver, and adds a strategic element to the gameplay; especially in multiplayer mode. Multiplayer mode will allow 4 players to battle it out against each other in a variety of racing modes, including Team Race, Eliminator, Drag Race, and Drift Challenge. The World Tour career mode will also allow for multiplayer co-op, where all upgrades earned by players during races will be pooled to the lead gamer's profile. This is shaping up as a great way to play with your mates while furthering your own career! NfS Nitro's release date has been brought forward to 3rd November 09 in North America, and 6th November 09 in other regions, and is available to order now from Amazon and Amazon.co.uk , with Free Super Saver delivery. Need for Speed Nitro and other hotly anticipated games can all be found in the Video Game Previews section.